Having a first aid kit when you are hiking or camping is essential. If you end up really needing it, you'll be glad you brought a complete kit for the outdoors. Imagine this. You have arrived at the campground and sent the kids off to play by the lakeshore while you set up camp. You are pitching the tent and organizing the camp kitchen. The kids find some rocks to skip in the water and are running back and forth on the shore. A simple trip and fall can bruise and cut a knee, which might not seem that bad, but when you add in some dirt things change. A bee sting or allergic reaction to a stinging plant might not feel good, but can be easily remedied with some medication. It is during these blissful moments at the campground that we tend to get excited and somewhat prone to those little mishaps, like scrapes and minor cuts, while moving all the gear and setting up equipment. If you are planning on spending time outdoors, you'll want to make sure to bring a few camping first aid essentials. 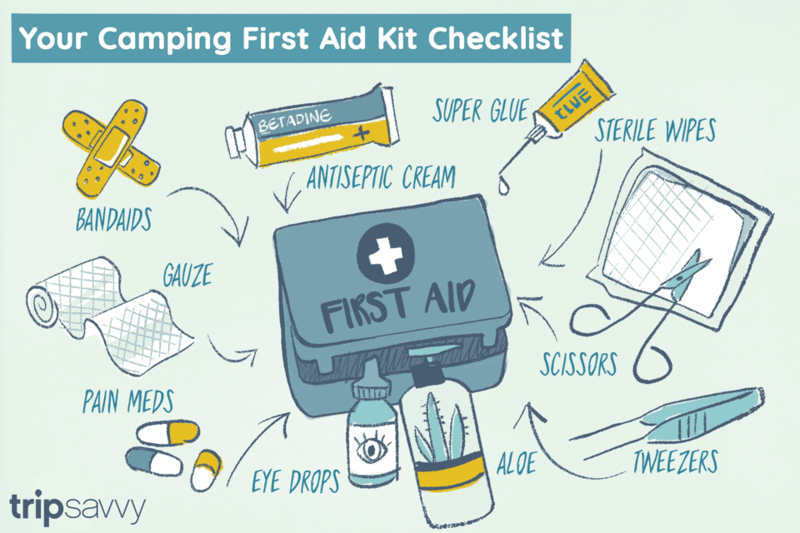 Be prepared for camping accidents with a well-stocked first aid kit. If you are looking for a complete camping first aid checklist you found it. You can create your own wilderness first aid kit with a few items, or buy a basic first aid kit from your local pharmacy and add a few items specific to your camping adventure. So what kind of accidents should one anticipate while camping? Well, there are always the occasional cuts, scrapes, and scratches. We're playing outdoors now, and common camping chores can be hazardous. Hiking through brush, thorn bushes, or cactus; cooking outdoors or around campfires; and exposing ourselves to the elements and insects are just some examples of the outdoor activities that require our attention. Be prepared and know what to do in a wilderness emergency. To remedy cuts, scrapes, and scratches, include a variety of bandages, and also have some antiseptic wipes and antibiotic cream on hand. Hydrogen peroxide comes in handy for washing out cuts, and a saline solution is a great relief for washing out eyes should you happen to sit too close to a campfire and get ashes or cinders in them. Q-tips and liquid pain relief solution come in handy for bug bites or small cuts and scratches. Tweezers come in handy for removing thorns and splinters, and scissors or a knife will help to cut tape and bindings. Don't forget Tylenol and aspirin for headaches and internal pain relief, and for intestinal problems include some Imodium or other anti-diarrhea medicine. Other items to consider might be sunburn relief spray, preferably an Aloe Vera solution, Chapstick for the lips, zinc oxide for skin protection, burn cream, and where appropriate, a snakebite kit. A Leatherman multi-tool comes in handy for just about any situation and can also be a nice addition to your kit. As a final tip, be sure to check your first aid kit annually and replenish any exhausted or outdated medicines and supplies. And don't forget to always take a well-stocked first aid kit whenever you go camping. Now that you have a camping first aid kit ready for your next adventure, revisit the rest of our complete camping checklist so you don't leave any essential items at home.